San Diego State University (SDSU) full-time MBA students take 45 total units, which is made up of 15 classes, over the course of 1.5 to two years. The SDSU full-time MBA curriculum requires 15-21 units of core courses that cover topics such as statistical analysis, marketing, and financial management. In addition, 18 units of electives are required, and 12 of those 18 units can be devoted to a specialization. One business strategy course as well as one culminating experience course–at three units each–are also required. The elective/specialization courses cover topics in accounting, entrepreneurship, finance, health services administration, information systems, international business, management, marketing, project management, and supply chain management. There are 230 students enrolled in the SDSU full-time MBA program About 57.4 percent of the class is comprised of male students, with 42.6 percent female students. Nearly 46.5 percent of the class is of international distinction. Students are, on average, 27-years old. The average GMAT score is 603 (520-690 range), and the average work experience per student is 4.3 years. An estimated 57.6 percent of full-time MBA graduates were employed three months after graduating. The overall average base salary of those grads is a reported $60,274, going as high as $117,000 per year. The estimated tuition for SDSU full-time MBA students costs $14,588 per year for California residents and $23,696 per year for out-of-state residents. These costs do not include housing, books, or other miscellaneous items, which cost an estimated $17,015 for full-time students. Financial aid may be available for MBA students who need assistance with their studies. Graduate students may qualify for a Federal Direct Grad PLUS Loan, as well as subsidized or unsubsidized loans. Furthermore, SDSU scholarships may be available for MBA students. There is one fellowship offering for full-time SDSU MBAs, as well as nine teaching assistantships, and 27 research assistantships. SDSU Fowler full-time MBA applicants need to submit transcripts from previous institutions, GMAT or GRE scores, a current résumé, a statement of purpose, two letters of recommendation, and the completed program application. A $55 application fee is also required. The GMAT or GRE may be waived in light of a Ph.D., MD or JD degree only. While work experience is not required to apply, the program does encourage at least two years of it. Non-native English speaking applicants must provide either TOEFL or IELTS scores by April 1. Students should apply to the College of Business Administration between August 11 and November 1. 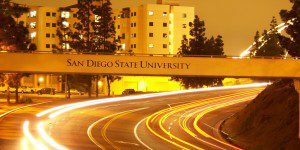 What San Diego MBAs Offer the Best Return on Investment? What Are The Highest Paid MBA Salaries in San Diego?